Take Control Of Your Pricing At The Shelf. 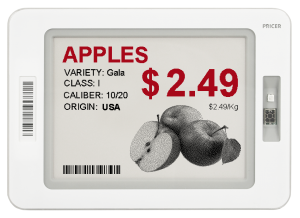 Pricer Electronic Shelf Labels (ESL) are the most reliable electronic shelf label system in the world. At the core of the solution lies the label itself which is extremely reliable, robust and long-lasting. It’s superior effectiveness relies on the superior infrastructure which no other digital price tag system offers. Pricer electronic shelf labels help the merchant save time with automatic price updates, store operations and task management. It’s more cost-efficient than paper and improves your customers’ experience with accurate, reliable pricing. Pricer’s ESL automation system allows for integration either by pricing file import or by API. For example, Catapult Retail POS offers a seamless pricing file synchronization with the Pricer Shelf Label solution. 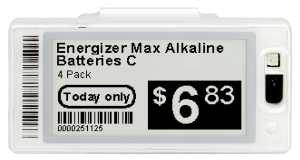 Why Are Pricer Electronic Shelf Labels Different? Pricer uses “Optical Wireless Communication” (OWC) – it does not use the loaded wifi wireless bandwidths. In other words, it doesn’t burden your existing network with traffic, and it does not rely on frequencies that are already overcrowded with wireless communications. OWC enables wireless connectivity using a near infrared band. With its powerful features such as high bandwidth, low cost and operation in an unregulated spectrum, OWC is a very powerful wireless technology. As robust, scalable and powerful OWC technology is, its commercial use not surprisingly has been limited to military operations in the past. But in the demanding retail environment, nothing could be more fitting than optical communications. The optical wireless communication developed by Pricer is extremely power efficient. Physics defines that listening to optical traffic consumes ~100 times less energy than radio. Why is optical communication more power efficient? The technical explanation is that a photodiode converts the incoming signal to MHz (1,000,000), while an RF antenna keeps the signal at GHz (1,000,000,000). This allows our ASIC to run at MHz, not GHz. While power consumption is relative to operating frequency this gives us an edge. Another key to success is that Pricer uses a custom-built ASIC (Application Specific Integrated Circuit) that is tailor-made for the electronic shelf label system. This avoids the compromises that have to be made when using an off-the-shelf SoC (System on Chip). Labels are the major part of an installation, so it is important to look beyond the initial cost. Compare the cost over the lifetime of the product when the price is similar, as labels that last longer and use less energy, cause less wireless “noise”, and produce less network traffic, will have a lower total cost of ownership (TCO). Remarkable Response Times – Less than 1 second! A responsive system with sub-one-second response time is critical for services like stock replenishment and eCommerce click and collect. In these cases, every second counts, and a solution that sleeps for 16 seconds is useless if you are trying to save only three seconds when picking orders. Our electronic shelf labels do not require line-of-sight, and it can handle any type of light situation (room lit by sunlight, moonlight, LEDs and other light sources), and perform outstandingly in any environment. There is no overlap with commonly used wireless devices that use other ranges of the electromagnetic spectrum, including radio waves, microwaves, visible light, and ultraviolet light. 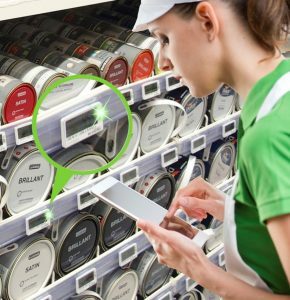 Because Pricer’s electronic shelf labels utilize a bidirectional (two-way) communication and trilateration, Pricer’s software can provide the retailer with accurate product positioning that is constantly updated and presented in real time. This capability enables a variety of apps accessible to employees and/or customers. Consumer apps that leverage product location can guide consumers to specific product locations. 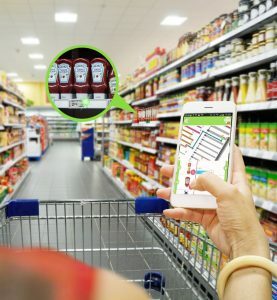 For the first time ever, retailers have an affordable accurate method for knowing exactly where all their products are located within the store with the least amount of administration labour possible. Using Pricer electronic shelf labels, the speed and accuracy of execution at the shelf improves, with significant improvement in operational performance metrics. Retailers can update up to 90,000 product shelf labels in an hour. Retailers improve management and compliance for internal (reset and promotional) and external (planogram, price and fixture) product execution purposes. 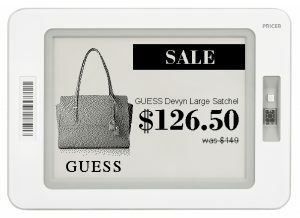 Each Pricer electronic shelf label has an LED that can be activated to flash on demand. Using this feature, the shelf becomes fully responsive to specific consumer needs when ESL lights are turned on to identify product location. Using label Flash, the store now has a remarkably efficient Click-and-Collect capability to assist store associates in faster product location for online ordering product fulfillment processes such as pick-list sequencing, task management, and product picking.